Many people know me as one half of the quilting industry team of Fons & Porter. Liz Porter and I met in a beginners’ quilting class in Winterset, Iowa, when both of us were young mothers in our twenties looking for a pastime that would satisfy our impatient natures, something that would stay “done.” Patchwork turned out to be the perfect solution, even though in the mid-1970s the rotary cutter, flippy corners, and paper foundation piecing were still in the future. Soon, we were teaching local classes ourselves—working as a team because neither of us had the confidence to do it solo. 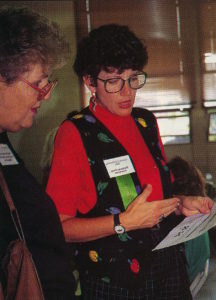 Teaching led to writing books—CLASSIC QUILTED VESTS in 1982, and many more after that, including the massive QUILTERS COMPLETE GUIDE in 1993, considered by many as the “bible of quilting.” Writing led to teaching for guilds and shops around Iowa, then around the Midwest, then all over the US, separately, eventually, rather than as a team. I taught for quilt guilds and at quilting conferences nationally for over two decades. 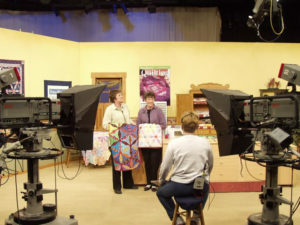 In the mid-1990s, we had the opportunity to launch a new magazine, which eventually became the highest circulated quilting magazine in the US, Fons & Porter’s Love of Quilting.We also decided quilters needed a different sort of how-to TV show (quilting buddies sewing together rather than host-and-guest) and managed to produce a 13-episode series and get it aired nationwide. We soon formed a relationship with Iowa Public Television, where over the years we co-hosted hundreds of solid instructional shows. 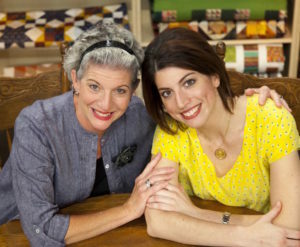 We sold Fons & Porter in 2006, and Liz retired from TV in 2009, but I had the amazing opportunity to continue with my daughter Mary Fons—a self-avowed beginner at first, but soon an accomplished maker and wonderful designer of both quilts and fabrics, eventually a magazine editor herself, a national teacher and lecturer, and now a passionate advocate for the American quilt. 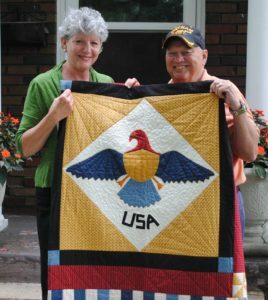 In my post-Fons & Porter years, I turned my attention to Quilts of Valor Foundation, still in its early years as a nonprofit. Via QOVF, I found a way to perform National Service and promote quiltmaking at the same time, serving on the foundation’s board of directors for many years, helping revitalize its newsletter, QOVF THREADS, helping write its Policies & Procedures Manual, supporting its transition to a membership structure, and communicating the significance of the QOVF community to my industry. Soon, I fell in love with my own home town, Winterset, Iowa, county seat of Madison County of The Bridges of Madison County fame. During the years I spent making a living, I had overlooked the unique beauty of my own community. Read more about my love of Winterset here. I also transitioned my lifelong passion for stories and writing into a personal pursuit of fiction—studying craft, taking classes, participating in writing groups, and spending quality time with my nose in works of both contemporary and classic literature. You can check out what I’ve been reading lately here. Learn about the novel I wrote about my literary heroine Mary Shelley, author of Frankenstein, and my quest to be a published novelist here. I still enjoy designing and making quilts—as much now as I did when I started in my twenties. Take a look at what I’m working on here. In addition to my middle daughter Mary, I have two other children, Hannah Fons and Rebecca Fons. Rebecca’s husband Jack C. Newell is a talented filmmaker. I love that my family are creatives like me!